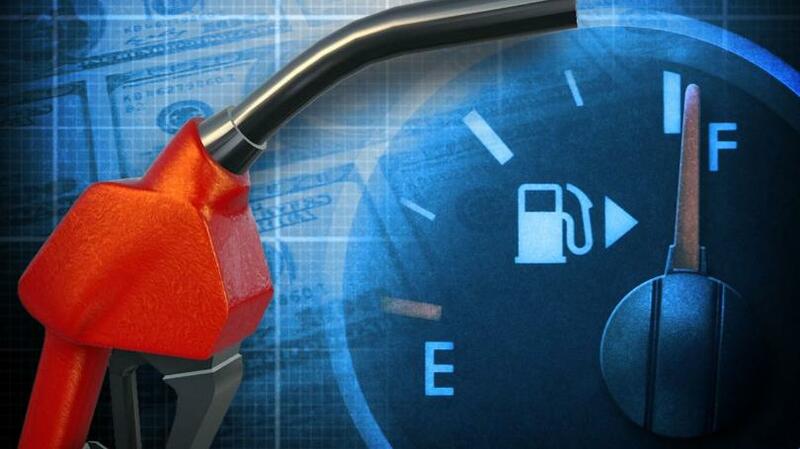 Amembal and Halladay | Leasing Fuels the Economy! Home Leasing Fuels the Economy! I would first like to express my deepest gratitude to the global equipment finance and leasing industry for having supported our firm in so many different ways since I co-founded it exactly 40 years ago. What started as a career became an adventure; and soon, a passion. Through almost four decades of traveling and teaching in over 80 countries, my life has been vastly enhanced by the thousands of leasing professionals I have encountered in my seminars. . I have witnessed leasing’s spectacular global growth over the past 40 years. In 1978, it accounted for a mere $22 billion in annual volume; today, it exceeds $1 trillion! As a part of the growth, I have seen the implementation of many of our thoughts and ideas – some have even developed into industry practices – a tribute that has been, to say the least, psychologically rewarding. It has indeed been a joy to witness and contribute to the growth of an extremely dynamic, vibrant, and resilient industry. Leasing’s growth has come about for a simple reason – it is an extremely viable financing alternative owing to the fact that it delivers a multiplicity of benefits to those who wisely choose to lease. I am in the midst of writing our 17th publication; and, for this newsletter article, I thought it would be appropriate to borrow from a chapter entitled “Winning the Deal” that demonstrates why leasing has been, and remains, a popular means of financing equipment. As I wrote the chapter, I must confess, I myself was overwhelmed to discover that leasing offers 36 benefits to customers, and I am sure my list is not entirely complete! Without being presumptuous, I doubt if there is any literature that does total justice to the benefits of leasing. Hence, as “simple” as the topic is, I feel it is appropriate to detail, in one place, the host of benefits leasing offers and thereby helps fuel varied economies throughout the world. 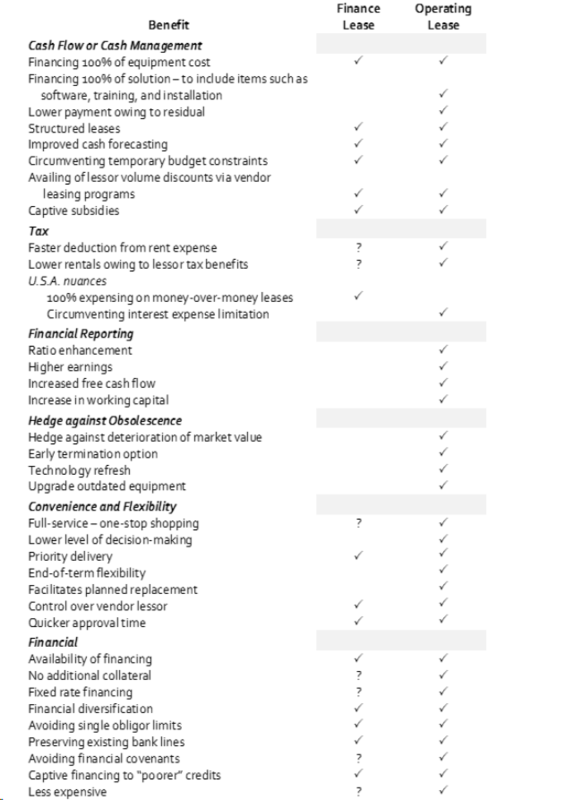 Leasing offers six major categories of benefits. Each of the six categories contains many subsets. Setting aside “complex” products such as TRAC leases, synthetic leases, leveraged leases and the like, which are themes and variations of the operating lease, there are only two types of leases: finance leases and operating leases (often referred to as FMV leases in the U.S.A.). The list, other than the two items under U.S.A. nuances, is not country specific. It is more than possible that there are other benefits in certain countries, specifically owing to tax or regulatory nuances. The “✓” indicates that the benefit is generally offered by the product in question. The “?” indicates that the benefit may be offered by the product. As an example: under Tax, rent expense is invariably claimed by lessees on operating leases; and often, it would result in a faster deduction than the otherwise depreciation. However, in a few countries, such as in Australia, there is no difference from a tax point of view between a finance lease and an operating lease; hence, the same benefit can be availed with a finance lease. Another example – under Convenience and Flexibility, some lessors offer full-service finance leases. I chose to write on this topic hoping that lessors would better comprehend the power that propels leasing. More importantly, I hope they will take the time and effort to enhance their marketing collateral so as to educate their potential and actual customers that leasing merits serious consideration compared to other means of acquiring equipment. 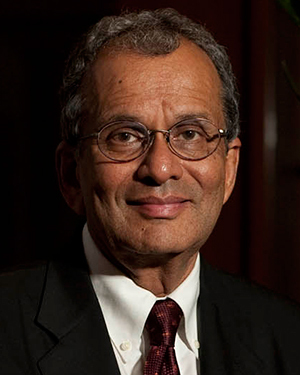 Sudhir P. Amembal is the Chairman & CEO of Amembal & Halladay. Mr. Amembal has authored or co-authored 16 publications for the equipment leasing industry, including the bestsellers “Winning With Leasing” and “The Handbook of Equipment Leasing”. Currently, he is working on a new publication that will be available in 2019. If you are interested in retaining us for an in-house seminar or consultancy project, please contact Kelly Farnham at kelly@amembalandhalladay.com.